Revealing his extensive research and the verifiable evidence he’s discovered, Frank Joseph presents a comprehensive military history of armed confrontations between humans and extraterrestrials in the 20th and 21st centuries. He explains how, with the development of atomic bombs and ballistic missiles, the frequency of extraterrestrial intervention in human affairs increased dramatically. He documents incidents both famous and little known, including the explosive demolition of U.S. munitions factories in 1916 by unearthly aerial vehicles, the Red Baron’s dogfight with a UFO during WWI, “foo fighter” sightings and battles with Allied and Axis combatants during WWII, and eye-witness reports from encounters during the Korean War, the Vietnam War, the Gulf War in Iraq, and the ongoing hostilities in the Middle East. He examines the evidence for the shoot-down of “flying saucers” at Roswell and Aztec, New Mexico, alien sabotage of nuclear weapons systems, and in-flight abductions of USAF and Soviet officers and airplanes. He explores the photo evidence for the Battle of Los Angeles, which occurred three months after Pearl Harbor, and the details of Operation Highjump, the U.S. Navy’s defeat in Antarctica by ET forces 17 months after the atomic bomb was dropped on Nagasaki, while also uncovering evidence of secret Antarctic German bases. The author also examines recent, 21st-century examples of alien interdiction in Earthly affairs, such as the meltdown of the Fukushima Daiichi nuclear plant in Japan and the fiery abort of Elon Musk’s Falcon 9 missile launch, both events accompanied by UFOs. 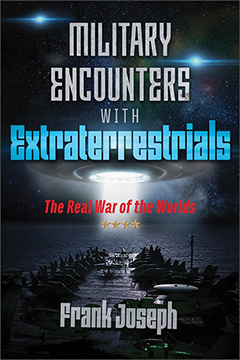 MILITARY ENCOUNTERS WITH EXTRATERRESTRIALS: The Real War of the Worlds By Frank Joseph. 320 Pages. 6x9 Paperback. Illustrated. Bibliography. Index.